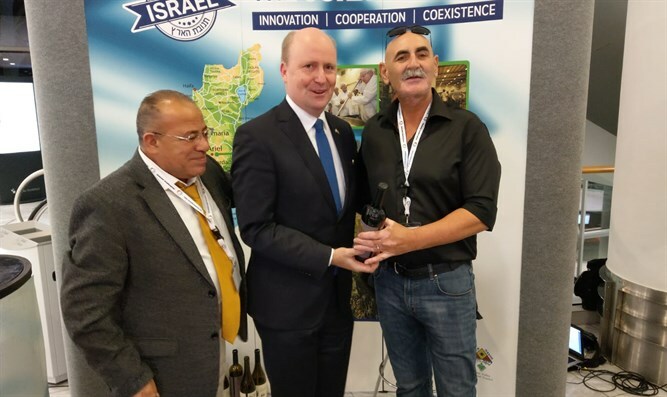 Frankfurt Mayor Uwe Becker visits pro-Israel conference, receives dates from Jordan Valley and wine from Judea and Samaria. Frankfurt Mayor Uwe Becker, who is considered a friend of Israel, on Monday morning visited the pro-Israel conference taking place in the city. He was received by members of the Israeli delegation, including the Mayor of the Jordan Valley Regional Council David Elhayani, and Palestinian Arab human rights activist Bassem Eid. Elhayani honored Becker with a gift - a package of dates from the Jordan Valley and wine produced in Judea and Samaria wineries. Becker is considered to be one of Israel's greatest supporters in Europe. He has spoken out against the anti-Israel Boycott, Divestment and Sanctions (BDS) movement and even made a landmark decision by turning Frankfurt into the first city in Europe to outlaw all official municipal support for boycotts of Israel. In addition, Becker initiated the kippot march in his city as a demonstration of solidarity against anti-Semitism. Finance Ministry Director-General Shai Babad also came to the Israeli information pavilion, praising Elhayani and his partners in their struggle against the BDS movement that harms both the Israeli and Palestinian Arab economies. For the past four days, the Israeli delegation has presented to the European public data proving that boycotting products from enterprises in the Jordan Valley which employ Israelis and Palestinians actually causes damage to the economy and income of the Palestinian side, even more than it damages the Israeli side.